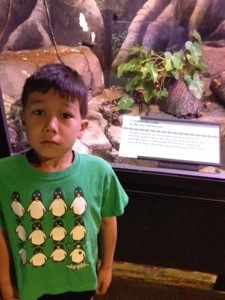 Sebastian next to a snake at the zoo. He does not like snakes. He is close to fluent in French, but no real German…. I’ll get him working on the German tonight…. I guess there is that! I hope he’s always this honest. I guess you can always hope, but if his brother is any indication…. He is awesome! And quite adorable. I don’t like snakes either. He seems to take after his mother on all three counts! I have a feeling your wife taught him a few French words that were not in the textbook after that response… Between these and OMG, what watch Must See TV comedy. Ha! you are probably right–I might have to watch out! I share his phobia and appreciate his seemingly predictable candor. That photo… poor thing is petrified. There will be payback for you sir. Most likely when you are old. He is also a bit of a ham–I am pretty sure that there was at least an equal part of acting for the camera going on there…. Hmmm… sounds like my son. Do they have this acting class at day care / preschool that they don’t tell the parents about?